As with anything in life, when something is used again and again, it can look a little worn out and needs replacing – your kitchen isn’t any different. However, replacing an entire kitchen isn’t a quick, simple or cheap job – but giving your kitchen a quick refresh can really change the way your kitchen looks. If you love a little DIY then check out these seven ways to refresh and reboot your kitchen. Installing under-cabinet lighting is a great way to add extra light into your kitchen, and allows you to clearly see the kitchen worktops. You can instal under-cabinet LED strip lighting yourself with ease, and it can make your kitchen look bigger and brighter. Whether you want to go for white LED lights or colour changing lights is up to you, and under-cabinet lighting is easy on the budget. It’s a DIY job, and battery operated under-cabinet lights are much cheaper than you’d expect. Everything goes through wear and tear if it is used repeatedly, and kitchen cabinet handles are no exception. Whether you’ve got iron handles or wooden knobs, they all become marred and marked over time. Replacing them doesn’t break the bank, and you can do it yourself so there’s no need to get someone in there to do it. If you’ve recently replaced your kitchen cupboard doors but want to give your kitchen a little pizzazz, then get a little creative. You could paint your kitchen cabinets or attach lace medallions, spray stencils and other decorative items. This is a great way to add some personality into your kitchen, and it is pretty easy as well! Choose a wall in your kitchen and get some pain that’s two shades darker than the colour of your kitchen. If you don’t want to spend hours painting your kitchen cabinets, then a single accent wall will suffice! A new set of kitchen blinds or kitchen curtains shouldn’t cost a ridiculous amount, and replacing those worn out, stained blinds will give the your kitchen the facelift it deserves. Replacing the kitchen curtains is also something you can do yourself, saving you that extra cash! The backsplash behind the sink in the kitchen is often marked and stained from washing up and cooking. Painting over the backsplash with high gloss, wipe clean paint can help refresh this area and make the kitchen look much better. If you’re confident in your re-tiling skills, then why not re-tile your kitchen? It’s a great way to add a little pattern and colour to the room. A super easy way to give your kitchen a little refresh is by replacing the kitchen cupboard doors. 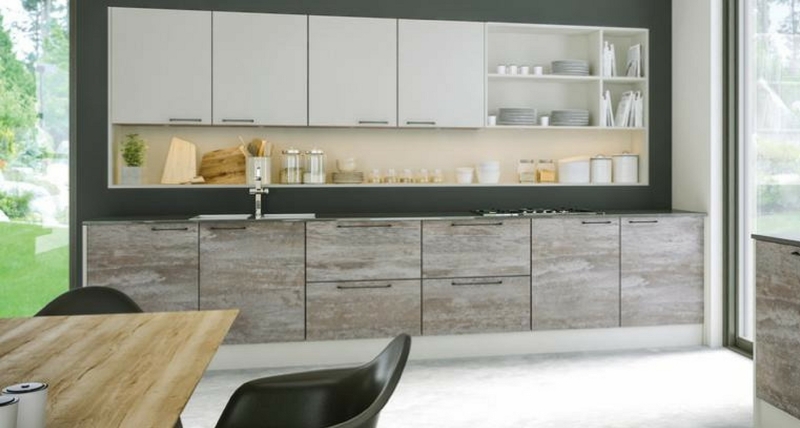 You could choose to go for high gloss handleless cupboard doors, or glass style shaker cupboard doors – all you have to do is order them and attach them yourself. There are so many ways you can reuse your old kitchen cupboard doors, so it makes sense! For more advice on ways to refresh your kitchen, do not hesitate to get in touch with Kitchen Door Hub.